Though Southwest Florida is home to many active adult communities, VillageWalk of Bonita Springs’ amazing amenities stand out from the rest. Florida’s VillageWalk of Bonita Springs offers world-class amenities that have made it a popular destination for active adults, retirees, and visiting snowbirds, even though the community is not age-restricted. Younger and older residents alike can enjoy life at VillageWalk of Bonita Springs and all the community has to offer. Like other active adult communities, VillageWalk of Bonita Springs provides many resort-style amenities. It also includes many daily services that may not be found within other communities. These services include a beauty salon, gas station, full service bank, and post office. Although Southwest Florida is home to many active adult communities, VillageWalk of Bonita Springs’ amazing amenities stand out from the rest. Nearly every street in the community is adjacent to one of VillageWalk’s lovely scenic lakes. The mile-long nature trail at the south end of the community is a feature that allows residents a safe, well-maintained walking path. The true heart of the community is certainly found at the Town Center. 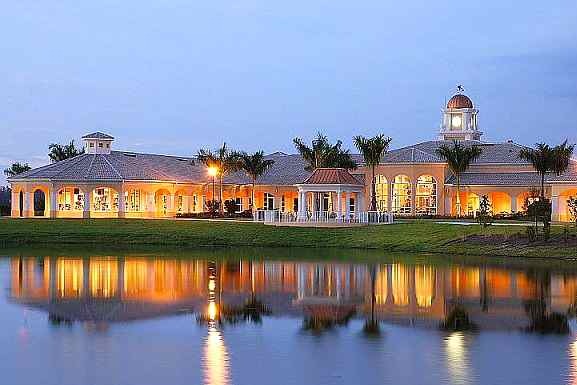 VillageWalk of Bonita Springs’ Town Center is a sprawling clubhouse which features a wide range of amenities. There is a fitness center which provides both strength and cardiovascular equipment as well as spectacular lake views through floor-to-ceiling windows. The large, multipurpose ballroom is perfect for a variety of community events, and residents can also socialize in the Great Room or the card room. The Railhead Cafe, also located in Town Center, serves breakfast, lunch, and dinner, and is open seven days a week. Additional Town Center businesses and services include a hair salon, nail salon, a full-service bank, a post office, gas pumps, and a car wash. The amenities do not stop indoors. Town Center’s impressive grounds include many outdoor amenities. There are tennis courts and a tennis pavilion, a lap pool and a resort-style pool, a basketball court, a bocce ball court, bike paths, and a lakeside gazebo. There is even a playground, which is great for when grandkids come to visit. VillageWalk of Bonita Springs is located south of Fort Myers and just north of Naples along Florida’s Gulf Coast. Both Fort Myers and Naples offer fabulous shopping, dining, recreation, and cultural attractions. There are nearby art galleries, golf courses, performing arts theaters, botanical gardens, and medical facilities. The Gulf of Mexico itself is a key attraction. Residents will love living just minutes from beautiful coastal beaches ideal for swimming, boating, fishing, and other water-based activities. The Gulf also influences the weather, leading to South Florida’s famous sunny climate. With so many amazing amenities in a sought-after area, it is easy to see why this active lifestyle community is popular among active adults. For homebuyers seeking an energetic community on Florida’s southwest coast, VillageWalk of Bonita Springs may be the ideal destination with resale homes for sale. Click here to request more information on VillageWalk of Bonita Springs.